The Quadratic Transformer was developed to support the learning of quadratic functions, and in particular to help you understand the connections between symbolic and graphic representations. Indirectly, it also helps you connect either of these representations to number patterns or physical situations. The information presented here is designed to familiarize you with all the functionality of the Quadratic Transformer. The illustration below shows the interface and names of the different areas. Each of these areas will be explained in this guide. To use this guide, it helps to have the Quadratic Transformer open. This will make the concepts clearer and allow you to experiment as we discuss each feature. Click to launch the Quadratic Transformer. If you make changes to the parabola’s graphical form, the symbolic representation also changes. Likewise, if you change the symbolic expression, the graphical form changes. An important part of learning about the relationship between the graphic and symbolic forms of quadratic functions is the ability to see how changes in one form affect another. With the Quadratic Transformer, you can see changes in the graphic form of a function reflected simultaneously in the symbolic form. Click one of the buttons (for example to translate the function horizontally). Move your cursor over the Graph Window (the cursor will look like a hand), and then over the parabola—until the cursor changes to match the button you selected. Click and drag to transform the parabola. While you are dragging the parabola, notice the real-time changes in the symbolic representations at the right and bottom of the window. Note When the cursor is in the hand shape, clicking and dragging on the Graph Window will move the entire plane of the graph. This is useful if you wish to place the (0,0) coordinate in an off-center position in the window. For precise control over the position of a parabola, and direct control of the coefficients, use the form selector tabs: Polynomial Form, Vertex Form, or Root Form. These let you view and change the coefficients directly. The parabola now is highlighted. The symbolic representation is bold. Click the coefficient that you wish to change. The coefficient then appears highlighted in blue. In Vertex form, translating (dragging) the parabola using the vertical or horizontal translation tools changes the vertex numbers in the Function. In Root form, translating (dragging) the parabola using the vertical tool changes the values where the parabola crosses the x axis (the x-intercept). If a parabola does not intersect the x axis, when the Root form is selected two messages appear, “This Function has no real roots" (in the Root Form area) and “Root Form Not Valid” (in the symbolic representation list). Note You can choose the increments by which the coefficients change with the Step button, described in the next section. Gain more precise control of the coefficients in the Polynomial, Vertex, and Root Forms by using two buttons—the Step: 0.1 button and the Round button. The current setting has a faint blue border. Select the function you want to work with, and its form (using the Polynomial, Vertex, or Root tab). Within the tab area, click the particular number you want to round. When you open the Quadratic Transformer, a single function appears, displayed as both a parabola and symbolic expression. You can add and delete functions to compare different parabolic forms and quadratic expressions. Click New to create a new parabola and its symbolic expression (listed in the symbolic representation list). They will be in a different color from existing functions. If you have not moved or transformed the original (red) parabola, you may only see your new parabola on the screen, because all parabolas created with the New button appear in the same location. You can create a duplicate of an existing function. This allows you to create a new function that does not have to appear at the default location. Select the function to be duplicated by clicking either its symbolic expression or its parabola. The parabola now is highlighted and the symbolic representation is bold. The duplicate parabola exactly covers the original. However, you can see the new function listed in the symbolic representation list. Click on its symbolic representation or parabola to select it. Click Delete to remove all functions (in both graphic and symbolic forms), including the original. In the main window, select the parabola that you want to translate, dilate, or reflect (click on the parabola or its symbolic expression). In the lower part of the window, in the section labeled “Original function,” are tabs for the polynomial, vertex, and root forms. Click the tabs to select the form you wish to see. Further down, under “Transformed function,” are three expressions representing aspects of the new function that you are about to create. (Initially, these are identical to the Original Function.) You see these transformed expressions in the same polynomial, vertex, or root form you chose under "Original function." On the upper left side of the window are three available types of transformation: Translations, Dilations, or Reflections, with two forms available for each. Translations allow you to move the vertex around the coordinate plane without changing the dilation or direction of the parabola. Select f(x+a) to move the vertex along the X axis and f(x)+a to move the vertex along the Y axis. Dilations allow you to change the aperture or width of the parabola. Reflections allow you to reflect the parabola over x or y axis. The Start Over button becomes usable. Clicking it returns the interface to its state when you initially started working with a first or new source parabola. A new parabola (in a new color) appears on top of your existing parabola. In the Transformed Function area, a faint white square appears around a number (or negative sign); you can change the number by clicking it and using the arrows to its right. If you selected either Translation or Dilation, you can move your mouse over the new parabola to see Drag-to-Transform icons (just like those in the main Quadratic Transformer window). You can manipulate the new parabola by dragging it in the plane, or by changing the number or sign in the square in the Transformed function area. Cancel closes the window and returns you to the Quadratic Transformer main window, with no changes in your function. Apply adds the new parabola to the main window and its symbolic expression in the Symbolic Representation List. It also removes your original parabola from the Function Transformation window and makes the current parabola the source for another transformed function. OK adds the new parabola to the main window and its symbolic expression in the Symbolic Representation List, and closes the Function Transformation window. The Trace Vertex button is located at the right side under the Change X Scale and Change Y Scale buttons. When you change a function (with one of the Drag-to-Transform tools or by changing the symbolic representation), this feature shows you a “trail” or a trace of a parabola’s vertex positions on the graph. The trace appears as a series of small dots or crosses. If you drag the parabola, the trace dots will be closer together if you drag slowly; more spaced apart and less visible if you drag rapidly. The Quadratic Transformer is a flexible tool that can change to accommodate the quadratic functions you wish to enter. The numbering of the x and y coordinates can be increased or decreased independently with the Change X Scale and Change Y Scale buttons. Click the Change X Scale button. The button turns dark gray and the graph turns gray. When you mouse over the graph, your cursor becomes a horizontal double-ended arrow. Click and drag your mouse to expand the graph (if you drag away from the X axis) or to contract it (if you drag toward the X axis). When you have adjusted the scale, click Change X Scale again to disable scale dragging and return to the usual view. Click the Change Y Scale button. When you mouse over the graph, becomes a vertical double-ended arrow. Click and drag your mouse to expand the graph (if you drag away from the Y axis) or to contract (if you drag toward the Y axis). When you have adjusted the scale, click Change Y Scale again to disable scale dragging and return to the usual view. Click the Reset Scale button to return to the standard (default) scale for both the X and Y axes. When you roll your mouse over any empty area of the Graph Window (in any mode where the Window is white), the cursor appears as a hand image. If you click and drag the cursor when the hand is showing, you can drag the coordinate plane in any direction. This is handy if you wish to place the center of the plane (0,0) in an off-center position, or view parts of the parabola that are not easily seen unless the plane is moved to the side. Be careful! If you move the plane to a point where you cannot see either the X axis or the Y axis, you may "lose" the center of your Graph Window or your entire parabola. Drag back toward the center, and they should reappear. Beside each symbolic representation in the Symbolic Representation List is a visibility checkbox. Whenever you add a new function, the box appears checked and the function is visible. To temporarily hide the graphical representation of a function, click its visibility checkbox. To make it reappear, click the checkbox again. Clicking on a visibility checkbox (whether to turn visibility on or off) automatically selects the corresponding function and parabola. If a parabola is hidden "behind" another parabola in the Graph Window, clicking its visibility checkbox makes the hidden function appear (it will look as if the parabola changed color). Choose the Group to which you belong in the (Select Group) drop down menu. 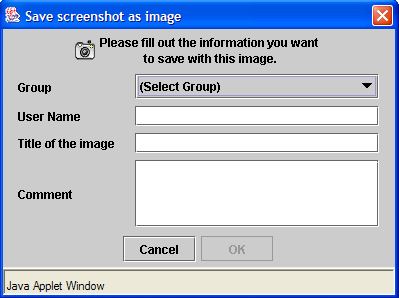 Images are saved and retrieved based on the group you select. Fill in the fields for User Name, Title of the image, and Comment. If you accidentally close the dialog box before you copy the address of the image, don't worry—just follow the instructions in Technical Help, How to Find an Interactive Image If You Don't Have the URL. Note If you are in a TeacherLine algebra course and would like to share your image in the Discussion Board, follow the directions in the course under Technical Help, How to Share an Image from an Interactive. If you click and drag the slider left or right, a circle moves along each parabola in a position matching the x coordinate of the slider. A small set of numbers accompanies the circle to display its x and y coordinates along the parabola. The About button is located at the bottom of the screen next to the Screenshot button. Clicking the About Button opens a dialog box that tells you the date and version number of the Quadratic Transformer interactive you are using. This can be helpful information to a support technician should you need technical assistance.